I think I’ve mentioned before that my book club tends to talk about Star Wars a lot. In one of these conversations, someone mentioned a novel that focused on minor crewmembers aboard the Death Star—and they had me at “canteen owner.” There’s a Death Star canteen? Do they have trays? And…no one in my book club had seen the Death Star Canteen sketch from Eddie Izzard, so they all stared at me blankly. So I sent them the above link, and added Death Star by Michael Reaves and Steve Perry to my “To Read” list. As promised, Death Star focuses on minor crewmembers aboard the battle station: a TIE fighter pilot, an archivist, a low-level architect, a doctor, a security guard. The trigger man for the biggest gun in the galaxy. A criminal who conned his way aboard. And, yes, the civilian contractor running the Hard Heart Cantina. The only really recognizable figures are Grand Moff Tarkin and, of course, Darth Vader himself. 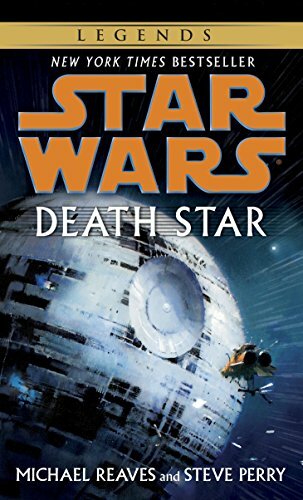 The book follows a dozen or so separate strands, as various people find their way to the Death Star during its construction…and then become peripherally involved in events of A New Hope. This is an odd book, set in an established universe but with very few of the characters who usually drive stories in that universe. Our favorite members of the Rebel Alliance do put in very small cameos, but mostly we’re hanging out with new people. And that…works and doesn’t. There are a lot of characters here, and it probably took me half the book to keep them straight—and it’s three-quarters of the book before the different strands really start coming together, apart from a vague geographic connection. But even though that seems like a problem, I enjoyed the different story lines, and the book was at least pretty good at reminding me who was who when I needed the clarification. So even though I’m intellectually bothered by the multitude of characters, I can’t honestly say it stopped me from enjoying the book. And I do really like the concept and how it was handled. The Death Star has a crew complement of a million people, and this book digs into who they all are and how they got there—and explores questions of personal responsibility in a way that the movies largely skate past. Who carries the guilt when a planet is destroyed? The Grand Moff who gave the order? The soldier who pulled the trigger? The architect who helped design crew quarters? The cantina owner who served drinks to the soldiers? At what point does merely standing by bring you in for a share of the responsibility? All the characters have their own paths and their own personal justifications for why they’re working for the Empire. Some are loyal soldiers. Some are apolitical, who feel no one government would be better than any other, so best to just get on. Some are prisoners, more or less literally, who justify cooperating with the enemy on the grounds of having no alternative. And these justifications come into crisis as the destruction by the Death Star grows. All of the book was interesting, but the best part was once events began paralleling the plot of A New Hope. I love seeing stories from different perspectives, and this was an intriguing look at familiar events from a new angle. What would it be like at the Death Star’s bar the night Alderaan exploded? How would an Imperial medic view the captured Leia, or a stormtrooper view Luke and Han’s rescue attempt? I suspect this book wouldn’t work at all if you haven’t seen the movie—too many assumptions made, too many explanations missing—but if you have seen the movie, it’s pretty fascinating. So how does it all come out when the Death Star is destroyed? Well…some characters survive. Some don’t. I won’t tell you which! But I do think that was the best way to handle the end. If every character I’d been following died, the book would have felt kind of pointless (and depressing!) If every character miraculously escaped, that would have felt contrived. As it is, this delivered a sobering but ultimately hopeful ending, a satisfying conclusion to a book exploring war, death and the morality around both. Glad you cleared up the point about the ending – I would have naturally assumed everyone would die and I think that would definitely put me off reading this book! Nice to know it’s not so cut and dried. Yes, that was something I wanted to know before reading too! There’s just one thing I’d like to know about the Death Star. Didn’t they think to put in some kind of a firing range where the storm troopers can get some target practice? They’re supposed to be soldiers, but they can’t seem to hit the broad side of a barn! I’ve read some unfavorable reviews and haven’t had the best success with any Michael Reaves co-written books that I’ve read, so I stayed away from this one despite thinking it sounded like a great idea for a novel. Have you watched any of the Space Janitors series on Geek and Sundry (YouTube)? It takes on a similar concept, purely from a comedic perspective, and is fun. Groan-worthy at times, but fun. I don’t think I’ve read any other Michael Reaves books, so I can’t comment…I enjoyed this one, but a lot of it was concept, not necessarily the writing.